Great news. Our longest stayer the delightful Casey (Wildfire Casey) has been reserved and will be going home shortly. We are so pleased for this lovely boy who has been with us since March! 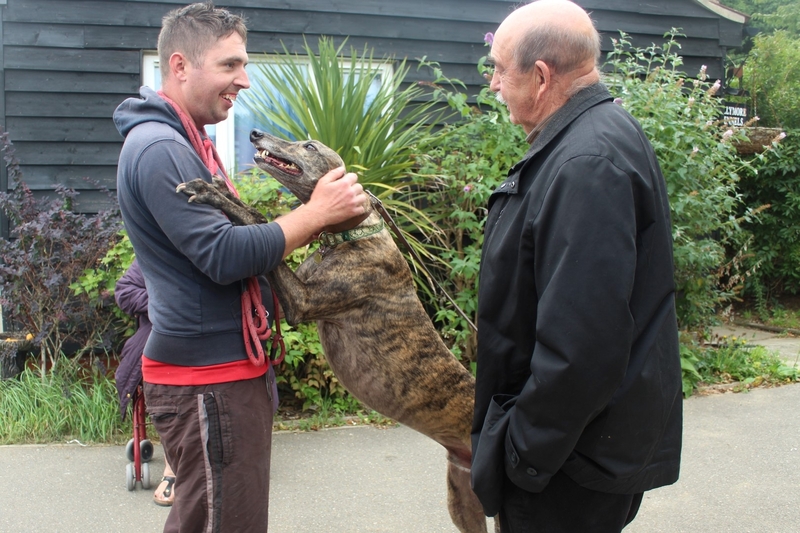 His fate was sealed at the Bentley fete and fun dog show when he met a little girl who was frightened of dogs. 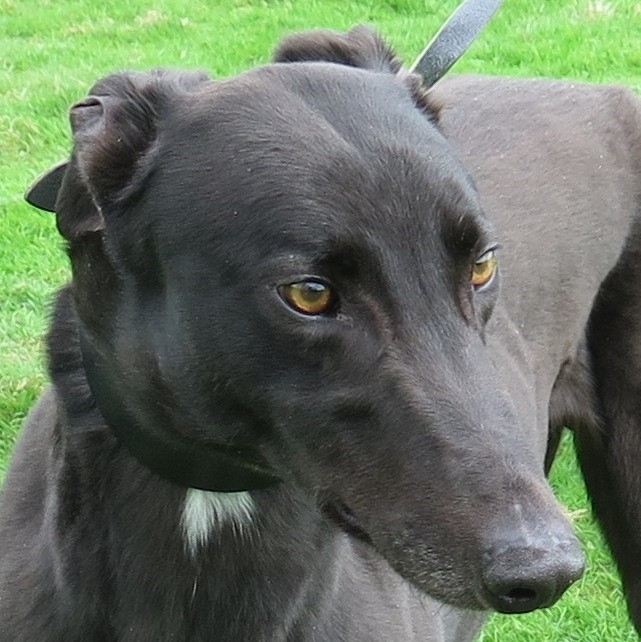 Casey’s calm and gentle nature won her over, she fell in love with him and now her family are in a position to offer him a home. It wasn’t really Casey’s turn to be at the fete but he went by default and we couldn’t be more pleased at the way things turned out. Blink and Dart went to Mills Mutts Doggy Day care centre again today where they are learning all about other breeds of dogs. We like to give our dogs as many new experiences as we can while they await their forever homes. Leo went for a lovely walk in Dedham with his homed pals Roy and Davey and then went to the Dedham Sun for lunch. We have an update on Pud now called Lily. 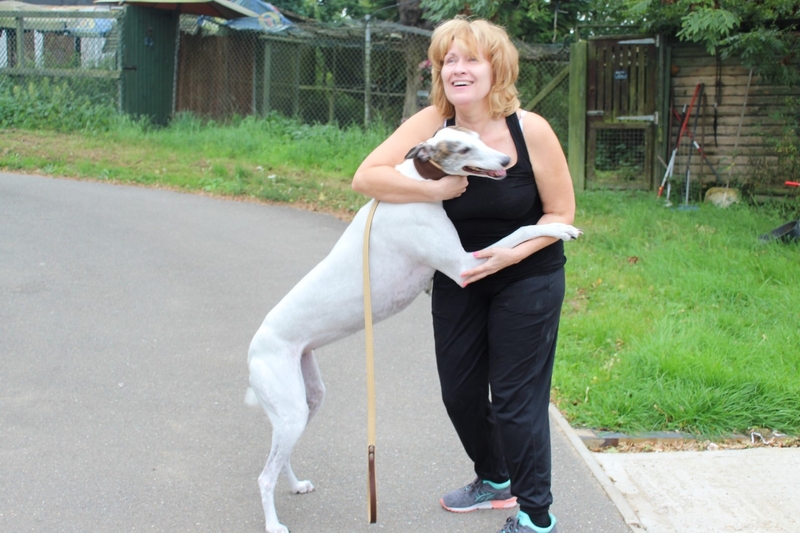 Pud was homed before we even had a chance to photograph her let alone put her on the website Jose who we homed last December came calling for a Lady friend. Just by chance Pud was being walked, Jose went over to say hello and that was that. They had a few dates before Pud went home with him and all is going well. Pud has settled in nicely and as you can see it didn’t take her long to join Jose on the sofa! 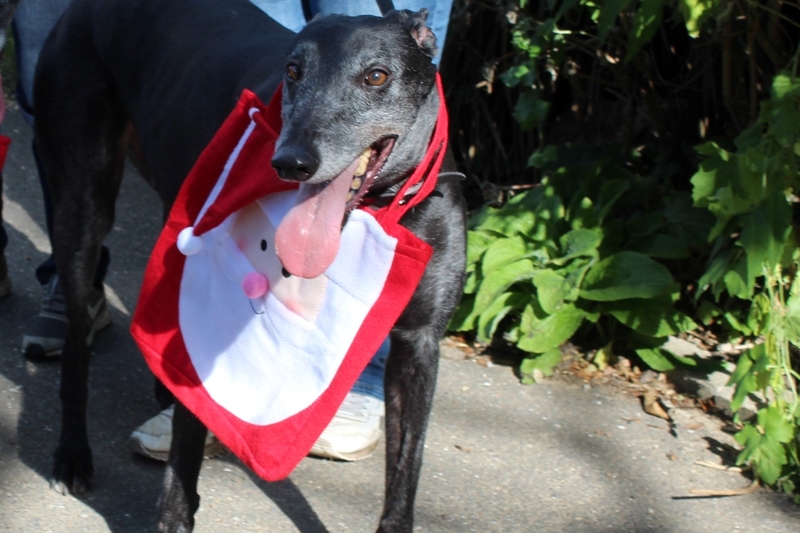 Dear old Revie is hoping somebody will offer him a forever home for Christmas. Revie is 10 years old and has been returned along with his friend Flo because of a change in family circumstances. He is pleased that Flo has found a new forever family but he is longing to be part of a loving family himself once more. He is such a happy chap in spite of the fact he has been through a heart breaking time. If you could offer Revie another chance of happiness please get in touch. 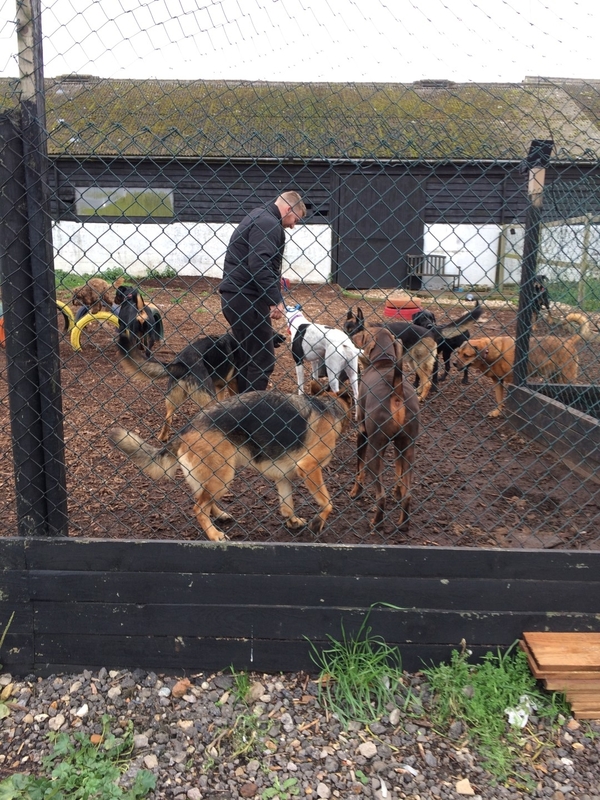 A busy weekend at kennels. We were visited by Toosie Beannie and My Mate Max who came to have their nails clipped. 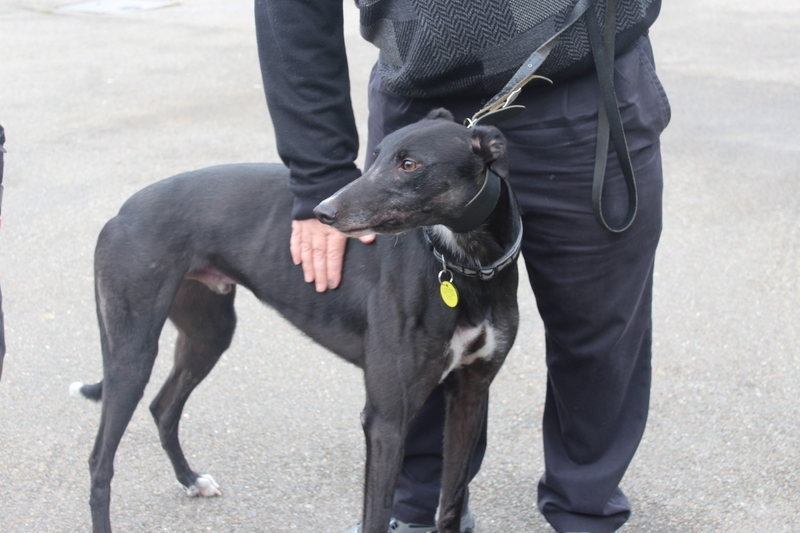 Blink who was reserved on Thursday had a visit from his new family and Cookie was given the good news that she has been reserved subject to a home check. 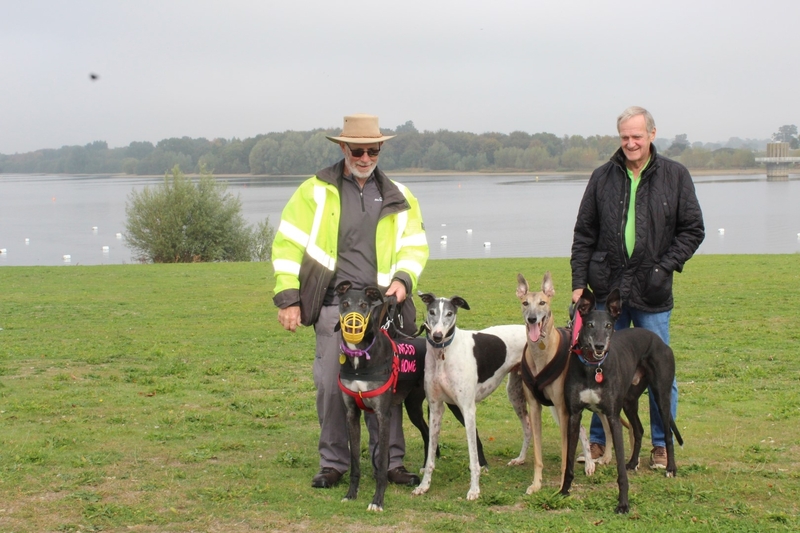 On top of all that we welcomed Des (Romeo Desperado) to our happy band of retired dogs and Sam went off to start his new life with his forever family. Well it might have been a grey day for most of us but the sun was shining in Bambi’s(Pacey Bambi) heart when he was visited by his racing family. He was taken for a walk with his friend Pacey Gina and had loads of cuddles. 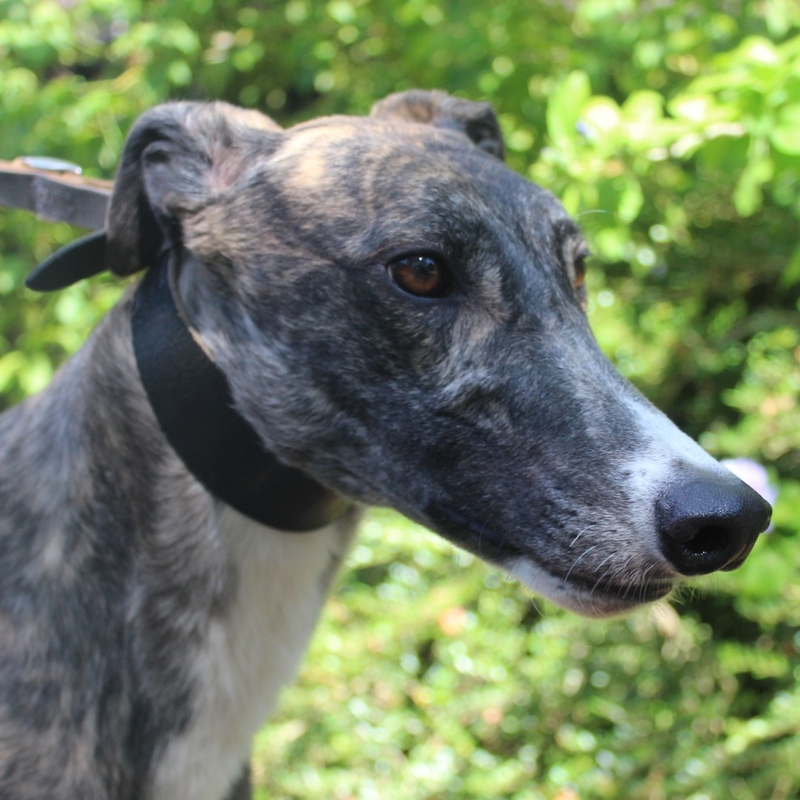 It was lovely to meet his racing family and we hope it wont be too long before we will be able to say Bambi has a forever home. He is a smashing lad. Two in and two out! It’s been a busy weekend at kennels. Firstly we welcomed two new arrivals. Handsome fellas Chilli and John can bee seen on our homeless hounds page. Then happy little sweetheart Blue went to his forever home and on Sunday we had the best news of the week when the lovely Chico went home after an almost 9 month wait for his forever home. Welcome Chilli and Jon and good luck to Blue and Chico – have a wonderful happy life boys. 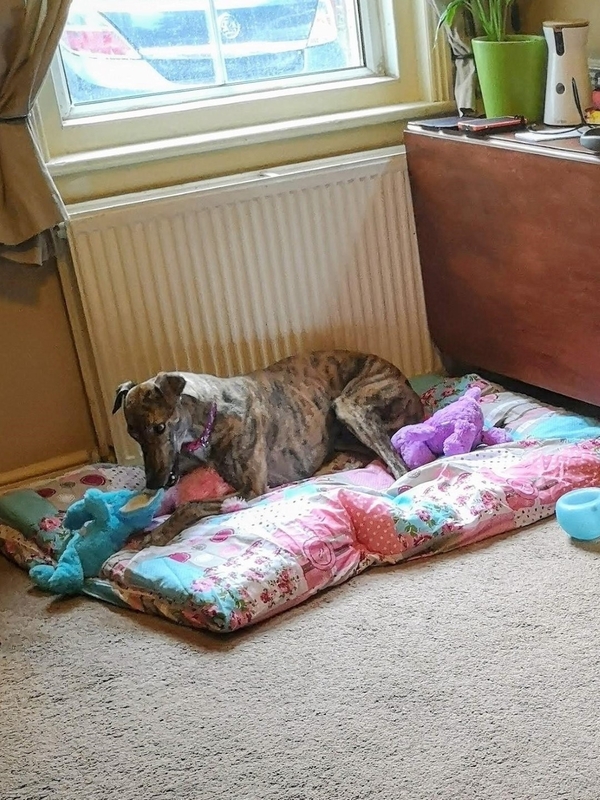 Our homeless hound Milly who has been waiting since March for her forever home had a walk around Alton Water with a gorgeous retriever called Darcy yesterday and a sleepover at greyhound Fox’s house with her Volunteer. 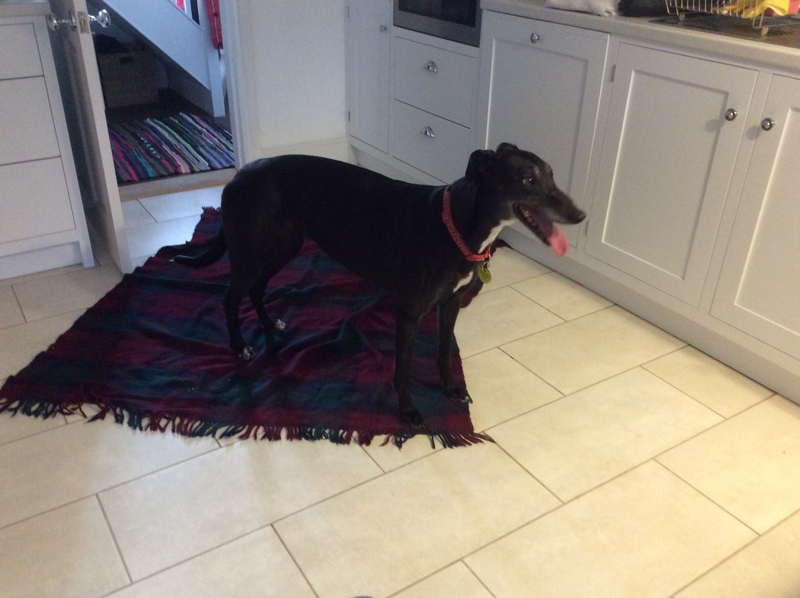 It had been brought to our attention that Milly was scared of slippery surfaces and so with the help of lots of mats etc laid over the tiled and laminate floors and with Fox’s encouragement Milly agreed to stay. She soon found her confidence, didn’t need the help of the mats after a while and had a great time. She is such an affectionate and sweet girl we hope she finds her forever home soon. Unbelievably for her first night in a strange place she woke her Volunteer up at 0.245 because she needed to go out to the toilet. What a good girl. It was good news for Irene this week when she learned she was reserved after a successful home check. 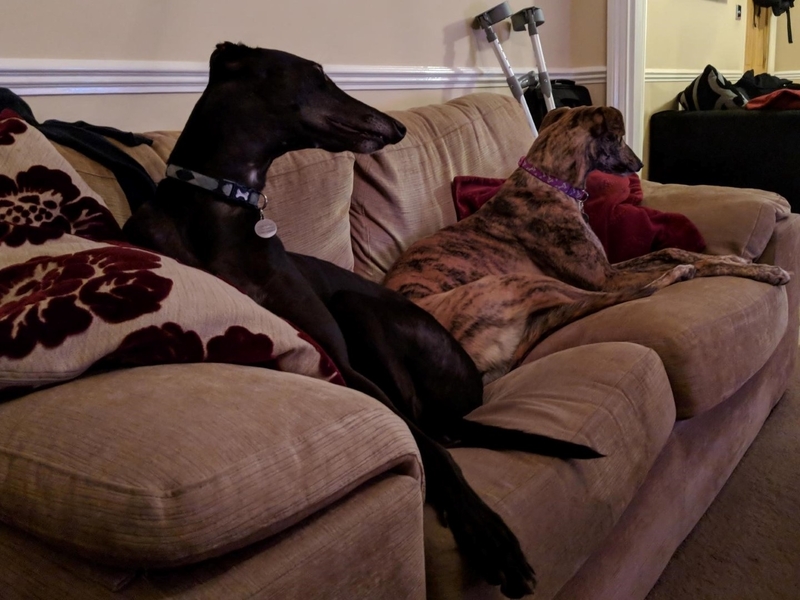 Missy went to her forever home and we wish her well, bless her she had a long wait and Milly had a lovely day out with her friend. 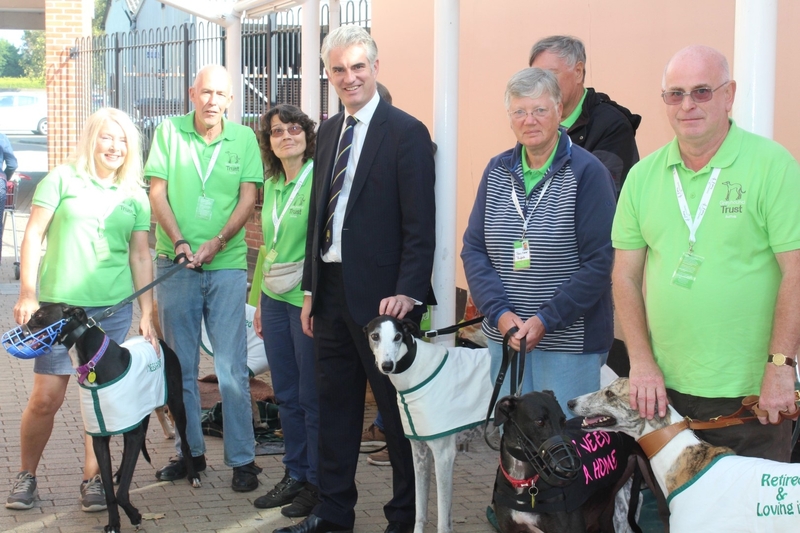 Following the disappointing news that the dogs couldn’t go to the Suffolk Dog Day because of the weather we cheered them all up with extra treats and a lovely cooling bath. We also welcomed Greaves (below) to our band of homeless hounds.